How many crop varieties can you name? | A balanced diet . . .
How many crop varieties can you name? Do you ever look at the variety name on a bag of potatoes in the supermarket? I do. Must get a life. 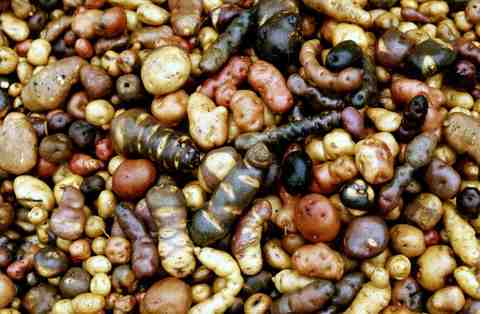 How many potato varieties can you name? Reds? Whites? Or something more specific, like Maris Piper, King Edward, or Desiree to name just three? Or do you look for the label that suggests this variety or that is better for baking, roasting, mashing? Let’s face it, we generally buy what a supermarket puts on the shelf, and the choice is pretty limited. What about varieties of rice? Would it just be long-grain, Japanese or Thai, arboreo, basmati, maybe jasmine? Today, our rather limited choice of varieties on the shelf does change over time as new ones are adopted by farmers, or promoted by the breeding companies because they have a better flavor, cooking quality, or can be grown more efficiently (often because they have been bred to resist diseases better). Apples on the other hand are almost always promoted and sold by variety: Golden Delicious, Pink Lady, Granny Smith, Red McIntosh, and Bramley are some of the most popular. That’s because, whether you consciously think about it, you are associating the variety name with fruit color, flavor and flesh texture (and use). But there were so many more apple varieties grown in the past, which we often now describe as ‘heirloom varieties’. Most of these are just not commercial any more. In many parts of the world, however, what we might consider as heirloom varieties are everyday agriculture for farmers. For example, a potato farmer in the Andes of South America, where the plant was first domesticated, might grow a dozen or more varieties in the same field. A rice farmer in the uplands of the Lao People’s Democratic Republic in Southeast Asia grows a whole mixture of varieties. As would a wheat farmer in the Middle East. There’s nothing heirloom or heritage about these varieties. This is survival. Heirloom potato varieties still grown by farmers in the Andes of Peru. 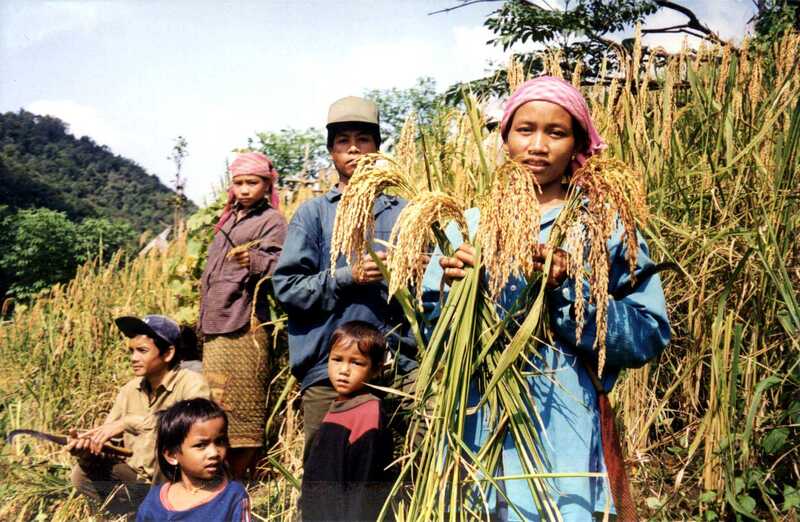 An upland rice farmer and her family in the Lao People’s Democratic Republic showing just some of the rice varieties they continue to cultivate. Many Lao rice varieties are glutinous (sticky) and particular to that country. What’s even more impressive is that these farmers know each of the varieties they grow, what characteristics (or traits) distinguish each from the next, whether it is disease resistant, what it tastes like, how productive it will be. And just as we name our children, all these varieties have names that, to our unsophisticated ears, sound rather exotic. Names can be a good proxy for the genetic diversity of varieties, but it’s not necessarily a perfect association. In the case of potatoes, for example, I have seen varieties that were clearly different (in terms of the shape and color of the tubers) but having the same name; while other varieties that we could show were genetically identical and looked the same had different names. The cultural aspects of naming crop varieties are extremely interesting and can point towards quite useful traits that a plant breeder might wish to introduce into a breeding program. Some years back, my colleague Appa Rao, I and others published a paper on how and why farmers name rice varieties in the Lao PDR. In the genebank of the International Rice Research Institute (IRRI) in Los Baños in the Philippines, there are more than 120,000 samples of cultivated rice. And from memory there are at least 65,000 unique names. Are these genetically distinct? In many cases, yes they are. The genebank of the International Potato Center (CIP) in Lima, Peru conserves about 4000 different potato varieties. What these potato and rice varieties represent (as do maize varieties from Mexico, wheats from the Middle East, soybeans from China, and beans from South and Central America, and many other crops) is an enormous wealth of genetic diversity or, if you prefer, agricultural biodiversity (agrobiodiversity): the genetic resources of the main staple crops and less widely planted crops that sustain human life. The efforts over the past six decades and more to collect and conserve these varieties (as seeds in genebanks wherever possible) provides a biological safety net for agriculture without depriving farmers of the genetic heritage of their indigenous crops. But as we have seen, time and time again, when offered choices—and that’s what it is all about—farmers may abandon their own crop varieties in favor of newly-bred ones that can offer the promise of higher productivity and better economic return. The choice is theirs (although agricultural policy in a number of countries has worked against the continued cultivation of so-called ‘farmer varieties’). Thank goodness for the genebanks of 11 centers of the global agricultural research partnership that is the Consultative Group on International Agricultural Research (CGIAR). These centers carefully conserve the largest, most important, and genetically-diverse collections of crop germplasm (and forages and trees) of the most important agricultural species. The flow of genetic materials to users around the world is sustained by the efforts of these genebanks under the International Treaty on Plant Genetic Resources for Food and Agriculture. And, of course, these collections have added long-term security because they are duplicated, for the most part, in the long-term vaults of the Svalbard Global Seed Vault¹ deep within a mountain on an island high above the Arctic Circle. Heritage is not just about conservation. Heritage is equally all about use. So it’s gratifying (and intriguing) to see how IRRI, for example, is partnering with the Philippines Department of Agriculture and farmers in an ‘heirloom rice project‘ that seeks ‘to enhance the productivity and enrich the legacy of heirloom or traditional rice through empowered communities in unfavorable rice-based ecosystems‘ by adding value to the traditional varieties that farmers continue to grow but which have not, until now, been widely-accepted commercially. I gather a project is being carried out by the International Maize and Wheat Improvement Center (CIMMYT) for maize in Mexico that aims to raise the cuisine profile of traditional varieties. Genetic conservation is about ensuring the survival of heritage varieties (and their wild relatives) for posterity. We owe a debt of gratitude to farmers over the millennia who have been the custodians of this important genetic diversity. It’s a duty of care on which humanity must not renege. ² The Seed Vault is owned and administered by the Ministry of Agriculture and Food on behalf of the Kingdom of Norway and is established as a service to the world community. The Global Crop Diversity Trust provides support for the ongoing operations of the Seed Vault, as well as funding for the preparation and shipment of seeds from developing countries to the facility. The Nordic Gene Bank (NordGen) operates the facility and maintains a public on-line database of samples stored in the seed vault. An International Advisory Council oversees the management and operations of the Seed Vault. This entry was posted in On my mind . . . and tagged CGIAR, CIP, genetic resources, germplasm conservation, Global Crop Diversity Trust, IRRI, Peru, Philippines, potato, rice, South America.